Blurb: How can so much awesome be packed into one book? It has a lot of high-fantasy flair, with great Russian roots. It doesn't take place in Russia, so you don't need to know anything about Russian culture to get it. Always a plus. But it allowed for some BEAUTIFUL imagery and language-building. Oh! I love the setting and language so much! Granted, the language was a little confusing at first, but there's a guide at the beginning that tells you the most important words you need to know. And after the first few chapters you start to get the hang of it. The characters were engaging and easy to sympathize with. I loved Alina. Yes, she's quite a bit self-deprecating at times, but I can understand why she would be. In her world the people of power can magic themselves into looking beautiful, therefore there's this idea that if you aren't extremely beautiful you aren't powerful. Makes sense that she would have some self-esteem issues. And her issues were totally believable. Watching her resolve them and come into her own made me so happy! Also, the villain was awesome. The whole time you're reading the book you think you know who the villain is, but then something happens that makes you doubt yourself, and by the time the villain is actually revealed you're on the edge of your seat! My head is STILL spinning from this! The same thing goes for the love interests. Yes, I said love interestS, as in plural. But for all of you rolling your eyes and such, Bardugo manages to stick in two love interests WITHOUT creating a love triangle. GENIUS! And the romance was there, but subtle. I would definitely classify this book as a fantasy, and not a romance. Sure, it's got some romance in it, as most great stories do, but it didn't overpower the plot. It was subtle, and beautiful. So there you go. I adored it. It was amazing. You all need to pre-order it right now and shower Leigh with love. That is all. Oh, wait, one more thing: There's some summary floating around the internet that describes this book as "The most compelling romance since Twilight." I'm currently on a personal quest to hunt down all of these summaries. Please ignore them. 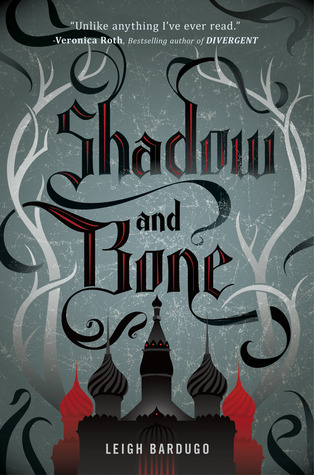 UPDATE: Leigh just posted today that books 2 & 3 have titles and you can win a personalized copy of Shadow & Bone! Go forth and do: CLICK HERE. Two love interests but no love triangle? That sounds interesting. *SQUEE! * I'm so excited for this book! I've already read some awesome reviews but your review makes me want to read it even more XD Great review! I'm always looking for a good fantasy! I LOVED this one too! Never before has a twist shocked me like this one did, I loved it!